When you’re craving Sweet Potato Pie and Pecan Pie, combine the two for a Cinnamon and Sugar Sweet Potato side dish. This post contains affiliate links and I will be compensated if you click through and make a purchase. I got this crazy idea to try and recreate a sweet potato and pecan pie as a healthier side dish for our Sunday Pork Roast. I’m kind of new to using sweet potatoes still, so I wasn’t sure how it would turn out. It actually just started as roasted sweet potatoes, but as I started cutting the sweet potato up, I thought I didn’t really want to turn on the oven. That was followed by trying to decide what spices to use. When I tossed in cinnamon and sugar, that’s when the idea of pie popped into my head. So I hit the cupboard and found my bag of chopped pecans. It all came together so nicely. The cinnamon and sugar added a nice little extra sweetness, that helped the kids enjoy the potatoes. YAY! I hope you enjoy these as well. I wish I could tell you exactly how to make the cranberry gravy I had with this as well, but since it came off the pork roast and I just thickened it up, I’ll have to try and recreate it soon. Peel and chop the Sweet Potato. In a frying pan, melt the butter, and add the sweet potatoes. Fry for about 5 minutes, and add the cinnamon sugar mixture and pecans. Fry for another 5-10 minutes, or until potatoes are cooked through, and slightly browned. Thanks for hosting, Adelina. I linked up a savory sweet potato dish this week 🙂 Cinnamon & sugar sweet potatoes are divine, yours look caramelized, gooey & yummy. Have a great week!! Adelina – I LOVE sweet potato, and with cinnamon it's a hit dish for me!! I can't wait to try this sweet potato recipe! You are a genius! 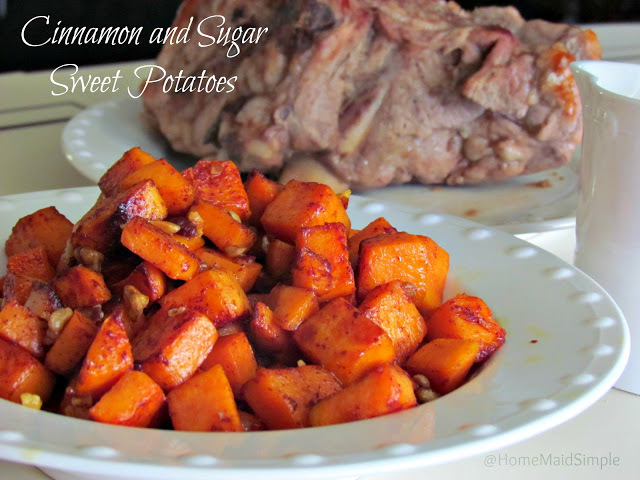 The cinnamon sounds so wonderful and what a great pairing sweet potatoes and pork. Thanks for hosting Adelina, have a great weekend! Mmmmmm….now that's the way I like my sweet potatoes prepared! Standard versions are available on Amazon, but I prefer non-stick. Thank you for the link to the pan! Your sweet potato recipe looks amazing and so simple. I'm pinning this one. Thanks. We love sweet potatoes and I'm always looking for new ways to serve them. I happen to dig cinnamon too. Thank you for hosting and for the feature! Thank you so much for stopping by and linking! I LOVE Sweet potatoes but not really when they are made sweeter… I might omit the sugar portion but still add the cinnamon. Hi! Found you through #SITSSummer … and I'm so glad I did! Love your blog … and looking forward to linking up on Foodie Friday's! Great recipe! I do food Friday and linked up! I'm visiting from #SITSSummer and bookmarked your blog to link up weekly! Great content!